US-based fork-lift manufacturer Hyster-Yale (www.hyster-yale.com) is set to embark on a £5 million expansion at its Craigavon factory, following council approval for its plans. Already the largest of the few remaining fork-lift production plants in Northern Ireland, the factory will be expanded by 61,000ft2 to accommodate a new range of fork-lift trucks. The company has been making fork-lifts at the 40-acre site since 1981 and now employs 670 people, having taken on 100 in the last three years to meet the high demand for its products. The plant, which exports to Europe, the Middle East and Africa, expects to make over 15,000 units this year. Stephen Kelly, chief executive of Manufacturing NI, said: “Hyster-Yale is benefitting from the huge growth in warehousing — not just in the UK but across Europe and beyond. 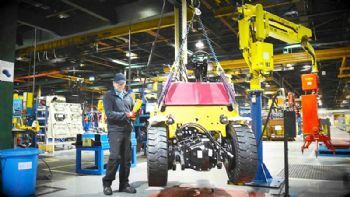 In its assessment of Hyster-Yale’s plans, a report from the Borough Council’s planning department said: “The plant has been a true success story in Northern Ireland, now employing hundreds of people.